Prime destination for raw, vegan and vegetarian cuisine at The Shops at Mauna Lani. 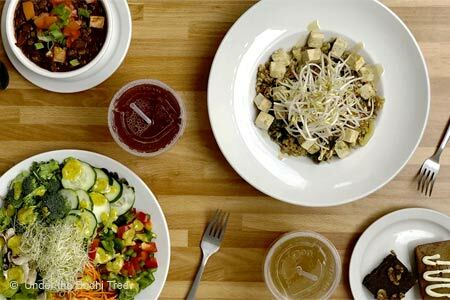 Daily Breakfast 7 a.m.-11 a.m., Lunch & Dinner 11 a.m. -7 p.m.
: The Shops at Mauna Lani is home to this eatery that attracts health-conscious diners with its thoughtfully presented raw, vegan and vegetarian cuisine. Breakfast options include steel-cut oats, multi-grain pancakes with genuine maple syrup, and a loaded scramble prepared with eggs or tofu and stuffed with locally grown spinach, kale, onions, garlic, mushrooms, tomatoes, sweet peppers, spicy chilies or kimchi, plus cheese if requested. Each morning order is served with a helping of home fries, local fruit or organic greens. For lunch or dinner, Nahkon Noodles is a hearty dish loaded with creamy coconut, green curry, brown rice pasta, Hamakua Coast mushrooms, vegetables, snow pea sprouts and macadamia nuts. The best part of the day is sipping 100 percent hot or iced Kona coffee. Also on offer are made-to-order juices with spinach, beets, carrots and more. Add chia, flax, spirulina, turmeric or cayenne to give each glass an energy boost. For dessert, choose from homemade breads and bars, sorbet, and the famous Raw Banana Soft Serve ready to be topped with macadamia nuts, dried coconut, cacao nibs or walnuts.